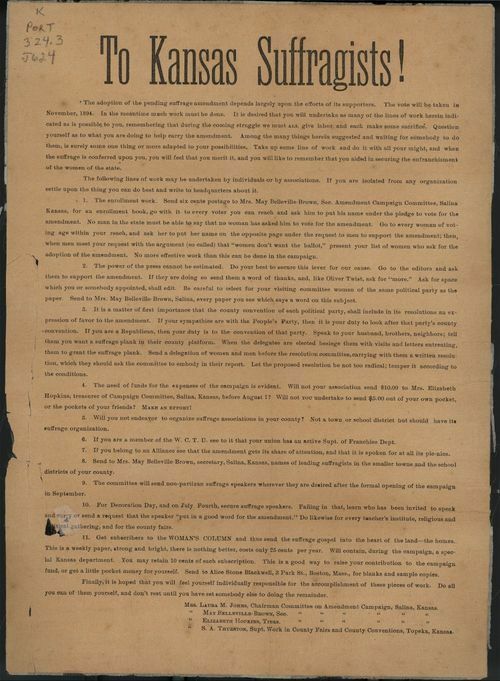 This leaflet outlines the work that Kansas suffragists must undertake to win the vote in November 1894. Kansas women were encouraged to donate money and their time to this cause. Women were needed to form suffrage associations or to increase enrollment of those already in existence, to work with their county conventions and draft a suffrage resolution, to speak with members of the press, and to promote suffrage at Farmer's Alliance meetings or other functions (such as those of the Women's Christian Temperance Union). Although this 1894 suffrage amendment failed, Kansas women continued to employ these techniques in other suffrage campaigns, including the successful campaign of 1912. This source could be grouped with Lucy B. Johnston's 1912 letter to the county suffrage associations to emphasize the continuity of the movement; many of these same tactics were used in the campaigns of the early 1900s. It illustrates for students the practical ways that average women could involve themselves in suffrage work.